You know, I was on the phone with sources at the bank and also, Vikram Pandit will be speaking to institutional investors at a closed door meeting at one o’clock today at Barclays Capital. I’ll be in on that call. Here is what’s going on at the bank and now, the bank understands, you know, any shares that they want to sell to pay back the government, will be dilutive to existing shareholders and that’s the case for Citigroup for a while. Citigroup’s Vikram Pandit says he’s dealing essentially with the equivalent of a 100 year flood and Citi’s market value has dropped below Home Depot and UPS, and the stake in Citigroup has been moving underwater and moving to unload assets bigger than the side of GE Capital and that’s the focus that they’re trying to unload into the market. So, what they’ve done in the interim is they’ve been moving rapidly to down size. They’ve cut off– they’ve cut out 96,000 jobs, they’ve brought their employee base below 300,000, they’ve cut 23% out of their cost structure. So, those costs have come down by 23%. And basically, they’ve gotten the FDIC to back its debt and the FDIC’s guaranteed debt program, that’s about $55 billion there. But what’s going on is the Fed’s debt program is set to expire and if the FDIC chooses to extend it, those fees will go up for that back stop from the FDIC, so, all the cost cutting that Citigroup is doing right now could be undone by more expensive borrowing down the road, so that is still a problem at Citigroup though and if Vikram Pandit is racing rapidly to try to either earn his way out of the mess and you know, the last two quarters we saw accounting on is one off. Basically help Citigroup hit the bottom line. On Wednesday, the Wall Street Journal reported that Citigroup (NYSE:C) is considering a offering of about $5 billion worth of stock to the public in order to buy out the same amount of shares held by the U.S. government. Just last week, the government exchanged some of its preferred shares for 7.7 billion shares of common stock in the bank. Clearly this preferred for common swap was highly dilutive to shareholders and shares have sold off by about 15% since last week. In addition to the dilution, the market fears whatC control the government will wield over Citi in day to day operations. At the Barclay’s (NYSE:BCS) conference, Citi’s Vikram Pandit further illustrated his plans for buying out the government’s stake. He plans to divest the rest of Citi’s remaining stake in Smith Barney as well as selling off other business units including CitiFinancial and Primerica over time. Citi’s stock is up by about 4% today, as investors are glad to hear that management is taking seriously the task of getting the government off of their back. 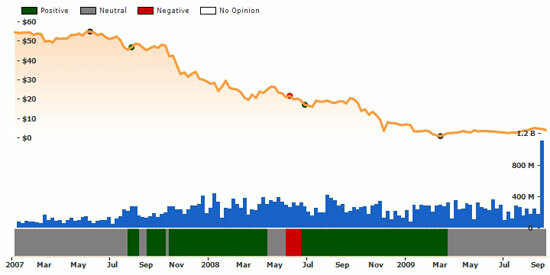 However, the bailouts of Citi, which came in three massive tranches, now total about 34% of the value of the company. It is going to take some serious maneuvering to completely buy out the government at this point. In all of the talk about paying off the government’s loans, there is no talk about earning their way out of this mess. The debt is just too great and the earnings potential is still pretty murky at this point. For example, Citi is expected to lose about 14 cents for full fiscal 2009, and consensus analysts are for profits of just 9 cents per share next year. It will take a few quarters of stability in order to count on paying back the government from profits. This is bad news for shareholders as they will have to either further raise capital, or sell of productive assets (probably both) in order to fill this gap. At Ockham, we are reaffirming our Fairly Valued rating on Citi, and we view today’s announcement as neutral for investors. Citi is planning to exchange about $5 billion of government held equity for $5 billion in privately held equity. The move does not effect Citi’s available capital, all it does is change the ownership. The recent conversion from preferred to common stock has been highly dilutive, and we are unconvinced that the dilution has ended. Furthermore, with Pandit eager to unload assets in order to pay back government loans, no one knows how much it will effect the company’s ability to generate earnings. We continue to believe that there is still plenty of risk in Citi, and the uncertainty more than outweighs the seemingly cheap nominal price. Does anyone in the media know how to write a positive article about Citigroup? Anyone? How about those pesky things called “facts”? Anyone know what those are? Citigroup, after conversion, owes the government $20 billion. It WAS $45 billion, now the government has 7.7 billion shares, and it can do whatever it wants with them. More than half of the TARP bailout has been paid back. And Citigroup hasn’t said anything about earning it’s way out because they’re hoping Q3 results will show that. It’s only a month away. A favorite trick by the media, I’m sure. Citi has already been able to raise billions in debt so bond issue or an equity for debt swap to find 5-10 billion to pay back the TARP is feasible even in the short term. And if some of the credit charges they took (much mre generous than GS JPM WFC here) do start to come back positive on the balance sheet umm well there will be profit. Also remember, in the spring of 2008 Citi began to sell off $400 billion in assets from their $2 trillion. They were interrupted by the plunge in markets and credit problems and the recession and those assets will fetch more and “toxic” debt will seem more clean as time goes by. Of course yes, it’s true, the world could end. But talking about Citigroup along with “victims” Lehman Bros. and GM the way the media has been doing is not really accurate. But then again … the media is dying too, right? Well said A.Ron could not have said it better myself. I really hate media with these false reports they keep telling things that aren´t true. Please for once give a report based on facts not just keep throwing rumours and scaring the public…..
Yepp, some bigshots pay for stories like this to bring the prices down. Do like them, and buy low!